At around 20:30 BST, 12:30 PST the new DamonCarltonAndAPolarBear site started selling its wares, and now nearly 12 hours later, guess what, it is all still available for sale. We have seen a smooth ordering process, which unfortunately has now been updated to stop multiple copies being purchased in one transaction, and some reports that their order status has now changed to shipped already. As to when the remaining will be for sale in the Quarantined areas we have no information on when this might happen, but there are eight slots and eight days to the final episode so maybe that is not a coincidence. Hi Jeffrey, Jason, its quiet here for now. I wonder if we will get any notice about the other posters being made available. my money would be one more going up right after tuesday's episode. I have absolutely no freakin' idea what's going to happen next. no one does - that's the fun! I could see a daily drop, but there might be spoils. I could also see an "all in one" drop, so there's more chance for people to grab what they like in the confusion. Who knows? Did anyone else receive a back order notice? I believe I got them for the Jacob and Jack prints. I order instantly after they became available, yet they still seem to be up for sale on the website. I'm going to go one a day. Seems to make the most sense and then the final poster is some epic scene from the finale that gets released a couple of hours after the finale has *sniff* finished. I don't get how nothing has sold out yet tbh. I can understand people with the tong prints and saying it has no sentimental feeling but it's still an awesome poster, so at least Hurley should be sold out by now. I'm hoping for one a day until the finale... but it seems almost too well planned out. Either that, or just drop all 8 day after finale. In the confusion, everyone would have a chance to nab their favorite, and maybe a few more of the prints before they are all gone. I simply can't put my life on hold for one a day. Can't do it. I´d love it if they drop one print a day until the finale, but I don´t think they will, first, because there will be prints with spoilers and some of them might be from the finale, and second, because I suppose GoMerch know not everybody can spend $50 plus shipping ($80+ for europeans) a day for 8 days ($400 a week plus shipping). I know you don´t have to buy them all but I think GoMerch will want to sell as many as possible and they know a lot of people will want to go for the full set. But as I said, I´d prefer 1 a day because I know I won´t be buying all of them anyway, and just because... I CAN´T WAIT! I'm hoping for one big release, purely because I know I can't afford more than one (maybe two, if there's two that I really love). But for the collectors, I hope it's one a day so they can go for the full set. As Chris said to me yesterday, we all have someone in our lives that shakes their head at us. that's what i was think Chris I have several. I was just giving him the lecture a while before it all went live that I hate T-shirts because they looks so lousy on me- yet I bought myself two lol He will know the instant I put it on. Lisa, just do what my mom does. Hide it in your wardrobe for a month so he never see's it and then wear it and when he asks, you just say I bought it months ago! Right, off to take my diploma to the framers. A nice cheap frame job I hope! Hide it in your wardrobe for a month so he never see's it and then wear it and when he asks, you just say I bought it months ago! @Ben, LOL, but very true (Ebola). Damn TeeFury. Teefury IS Ebola, isn't it? I love that someone is trying to sell the I'm with Jacob poster for $175 on eBay. The description even says it's your one and only chance to own this. Well, I must admit I thought about buying one of the posters just to have something to trade for, in case I missed any of the 8 prints that I really want. I thought this stuff would be a bit easier to get but would prob sell out so later on I would be able to trade it for one of the 8 prints plus some money. But at the very last moment I thought that spending $50 for a print I don´t want just in case I would need it for a trade was kinda silly, because what if it didn´t sell out and/or later on I didn´t want any of the 8 prints? I´d have to keep the print and would have wasted $80 for nothing Def not worth it. Btw there´s someone trying to sell his Jacob print for $200 as well. So I went to dinner with my wife last night. With all intentionality we decided to leave our phones at home to have a nice evening without distractions. We sit down and just a few minutes after we did....Henry Gale, his wife and another couple sit down next to us. We waited until I was done eating, but I introduced myself and thanked him for the work he did and said I had such an amazing time last night and was eternally grateful for the show. Everyone at the table was so excited and they said, "you were there! That was amazing!". Michael said it was so much fun to watch it with 1800 other people. Shook his hand and said thank you and good night. Fun dinner. My wife ran to the bathroom. She did not care to see my interaction. Were there 2XL sizes on all t-shirts or just a few? @Neal, that is awesome. We saw Michael in a play in December, and I was too shy to meet him. I am thrilled with the new checkout system. But I am weak. And the fact that items are still available keeps calling me. "buy me....buy me....LOST is almost over...you must have me....you will regret it later...buy me or you will scramble to buy at an increased price later....buy me...food is not important...buy me"
Ack! I need an intervention. Hahaha... I' am sooooo with you Andalone. So... if there´s is a new release today, are we expecting it to be the same time as yesterday´s? It really pisses me off that people try to fool others like that. I mean, it´s bad to try to charge huge amounts for something that was for sale for way less and was sold out, but trying to charge a lot for something which is still for sale for way less is... just not right. It was a really smart move by releasing all this cool stuff just 10 days before the end (boo-hoo). They just know us too well. We just can't resist one more poster, one more tee, one more anything with LOST on it! well, I'm here for the 8:30pm moment where NOTHING WILL HAPPEN. I'm still here just in case. Christ I'm pathetic. Lost prints are more addictive than heroin. Am I in time ? In time for what I'm not sure, but I've just finished psinting an undercoat in the front room so haven't been around. As ReverendMilo knows posters and paint don't always mix well. that should be "painting" by the way, I'm more tired than I thought. if that kid was mine, the second he turned 18 I'd be on his case for $1000. There is a possibility that we won't get anything new today and if it is one a day it will start tomorrow. That would give us 1 a day including the last episode day. Blimey... Did it really take EB to point that out? We must be losing the plot argers. Hey, I came up with that theory on my own, unfortunately it just looks like I copied now. Quick! check it out! NOTHING HAPPENED. Back to watching Fringe and openly weeping about Lost ending. Chris, a very long 9 days. So - the 4 artists that are doing a second print... who do we think they are? I'm guessing DD and OM as their profile is so high... Tong's done these 3 so probably not another? I'd like to see another Tan and another McCarthy. Thoughts if anyone is still there? I know I know... Fringe and chips take precedence! After arguing endlessly with some nim nods over at abc.com..about Jacob being a dim wit,,i now have bought a I'm with JACOB poster..How ironic,,but i must admit, the work of it looks very well done. So I hope a I'm With MIB is to come also..If so, which sells out first could be interesting. Site just changed with Jacob now occupying one of the quarantine boxes!!! changed again! Not Penny's Boat! How long until sell out on that do you think? boy there really doing alot with the Not Penny's Boat this time around. I already got the last two so I'm all set. I don't care for this one anyway and my wall space is full !! 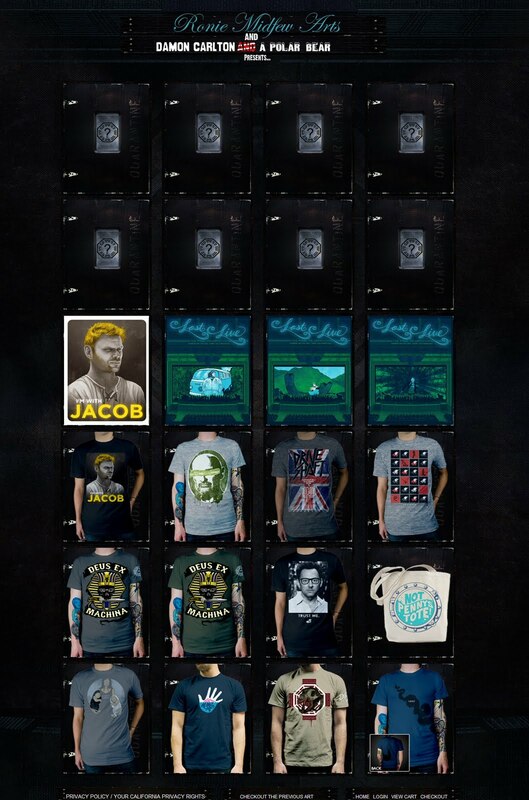 I do find myself liking the Jacob poster. Avoiding buying it though so putting it as a phone wallpaper. And I'm not with Jacob I gotta say. I'm with MIB so I'm with you on hoping for a poster with MIB. One a day then we think excluding the finale day or can we expect another 7 today? Pass for me too, even if it's a colassal mistake. ahahahahaha, I can't believe after me going on like that that a print DID go up. But wait... is this a moment from the final season? I mean, we've seen it in flashback, but still. I liked Milo's Not Penny's Boat print better. Pass. oh, it's the CAR from the moment Desmond works out he needs to move sideways. Still pass. It's Des outside the car. You can see the side mirror on the door. Neat way to tie the two scenes together. Typical as I go out something happens !!! I know Tyson is watching me I just don't know how.